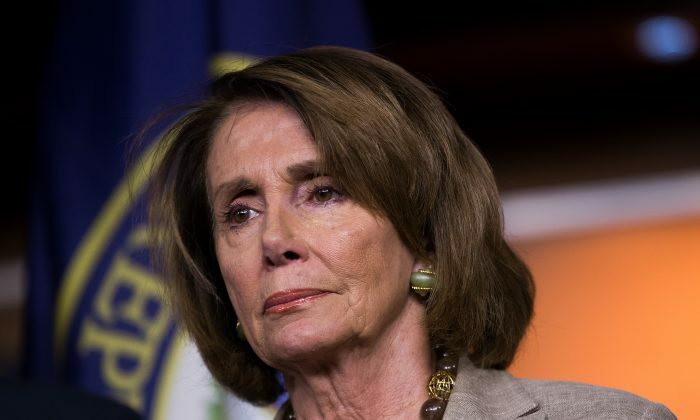 Two days after mobs of Antifa extremists attacked peaceful Trump supporters and conservatives, House Minority leader Nancy Pelosi condemned the group. “The violent actions of people calling themselves antifa in Berkeley this weekend deserve unequivocal condemnation, and the perpetrators should be arrested and prosecuted,” Pelosi said in a statement. Police made 13 arrests, and at least six people were injured, of which two were hospitalized, after members of the Antifa extremist group broke through barricades and violently attacked individuals and small groups of counterprotesters. Videos uploaded to social media show the extremists surrounding Trump supporters and conservatives, hitting them in the face with their fists, sticks, bottles filled with urine, and pepper spray. One video shows a man being chased, having his Trump flag and Trump hat stolen, and then being spat on while he sat on the ground. Police looked on as the violent incidents took place, after they were ordered by the police chief to stand down. 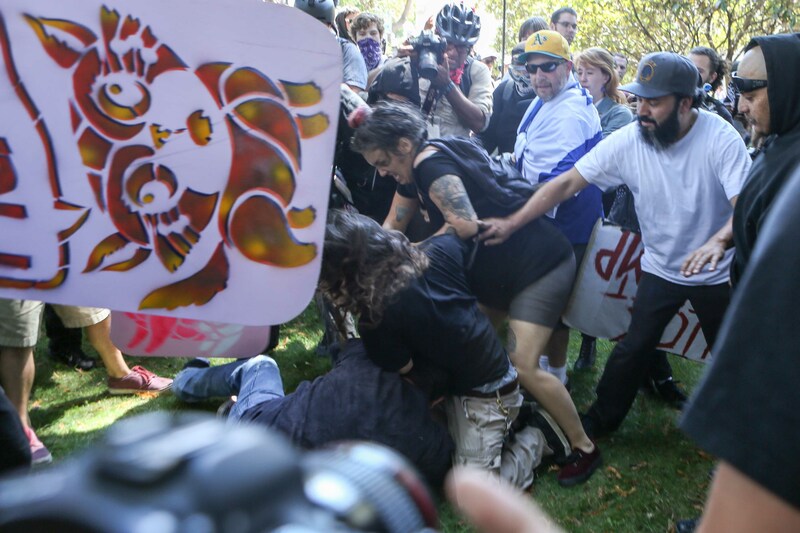 The violence was the latest in a string of violent actions by Antifa. In February this year, the group caused $150,000 in damage when it set fires and smashed windows at University of California–Berkeley in an attempt to prevent controversial conservative speaker Milo Yiannopoulos from giving a speech. Pressure had been growing on Pelosi, a leading voice for the Democratic Party, to condemn the violent acts. For instance, on Aug. 28, Fox News contributor Lisa Boothe called out Pelosi by name, asking when she would denounce the Antifa violence. Pelosi represents a district close to Berkeley. “They come dressed in uniforms. They have weapons. They’re almost a militia,” Arreguin told a local CBS affiliate. The condemnation of the Antifa extremists by Democrats comes weeks after President Donald Trump denounced the group’s violence in Charlottesville, Virginia. At the time, the president pointed to violent acts from both far-right and far-left extremists that led to dozens of injuries and the tragic death of a 32-year-old woman, when a car believed to be driven by a neo-Nazi sympathizer smashed into other cars at an intersection filled with left-wing protesters. Besides condemning white nationalists and neo-Nazis multiple times, on Aug. 15, Trump also called out Antifa by referring to their signature black clothes. “You see them come with the black outfits and with the helmets and the baseball bats,” Trump said. At the time, the president was widely criticized for his statements. But while several high-ranking Democrats have come out now condemning violence by Antifa, top Republican lawmakers have yet to make such a statement. Sen. Lindsey Graham (R-S.C.) took it one step further, inaccurately stating that Trump had suggested that members of hate groups such as the Ku Klux Klan were the same as the 32-year-old woman who was killed in the rally. At the time, Trump described Graham’s statements as a lie. Tim Pool, a reporter who covered Antifa protests in the United States on several occasions, said that the group still consists mostly of communists. “Predominantly I found that they are communists. There’s a lot of socialists involved and some anarchists, but typically when you see the violence, the people who tend to be more violent are communists,” Pool said in an interview with Tucker Carlson on Fox News. The Antifa group has its origins in Germany where it was founded in the 1920s as a front-group for the Soviet Union. The group was acting as the violent wing for Germany’s communist party (KPD) which had the goal of installing a communist dictatorship in Germany. Following Russia’s revolution, the communists believed Germany would be next as it had the second-largest communist party. While the group claimed it opposed fascism, in reality it used the label to oppose anyone opposing its communist ideology.